a small loss: Eggplant "bacon"
Last Monday, I hosted my second dinner party since moving to California - this time, it coincided with my book club's second meeting. We discussed F. Scott Fitzgerald's "Tender is the Night" - a surprisingly tough read for me. By the end, it was better, but the first part was a struggle - I just didn't fall head-over-heels the way I did with "The Great Gatsby." Given the story's settings in France (both the South, and Paris) and in New York, I had originally intended to prepare dinner to match the theme. Unfortunately, while the south of France is well known for seafood dishes, one of the guests is a vegan/social vegetarian (will eat eggs/dairy), so my adventures in bouillabaisse will have to wait. Since the meeting also synced up with my birthday, I decided to venture into pizza making. I love pizza, but cannot not eat it all on my own, so having six or seven other people to cook for made this the perfect opportunity. 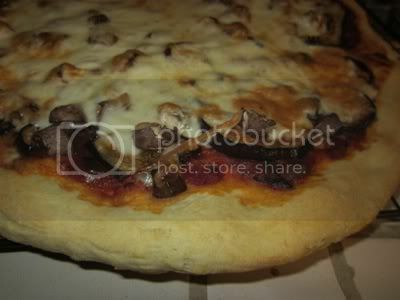 In Chicago, before getting healthier, I'd make pizza all the time. I would hop on a couple of buses to a little Italian bakery on Grand Avenue that sold raw pizza dough by the pound (and arancini, and cannoli, and amazing non-deep dish pizza by the slice - I'd get something to munch on while waiting for my pizza to cook, of course). It was amazingly delicious, and my mouth is watering thinking about how many little things I miss about living in The City of Neighborhoods, things that are unavailable in small town California. Since D'amato's just isn't an option right now, I decided to try and make my own crust. I used The Pioneer Woman's recipe, which was not only delicious but ridiculously easy. Preheat oven to 425º. Arrange eggplant slices in a single layer on a baking sheet lined with parchment paper and lightly sprayed with cooking spray. Bake for 8 minutes, then flip, respray, and bake for another 3-5 minutes or until lightly browned and a little crispy. Remove from oven and reduce heat to 350º. 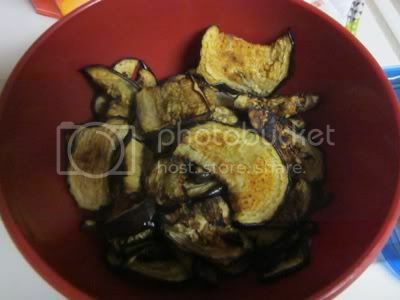 Combine soy sauce and liquid smoke and dip eggplant slices into the mixture, then replace them on the baking sheet. Bake for 3-5 minutes or until cooked through. As easy as that! Crispy like bacon. Smoky like bacon. But meat-free and much lower in calories! I put them on the pizza with baby portobello mushroom slices, homemade tomato sauce, and a blend of Italian cheeses - not exactly a low calorie dinner, but better than if I had used real bacon. Since the eggplant didn't soak up all the soy sauce/liquid smoke mixture, I saved the rest of it and tried basically the same recipe with brussels sprouts yesterday afternoon - I heated the oven to 400º, tossed a pound of halved sprouts with the leftover liquid (about half the original recipe), then arranged them split-side-down on a baking sheet I had sprayed with cooking spray. I baked them for 5 minutes, then flipped them over and baked them for 8 more. I loved brussels sprouts before. But I think I love them even more now. I want to investigate more into liquid smoke, and see what I can do with it - if I could use it without the soy sauce, since even low sodium soy sauce is very salty. Liquid aminos, perhaps? We'll see. Expect more good things from my kitchen soon! What about you? What new ingredient(s) have you tried lately? I made a sweet potato casserole for Thanksgiving, but instead of using our old standby that we have had for years, I made it vegan by skipping the butter, using coconut oil and layering granny smith apples into the casserole [to cut some of the sweet.] It was amazing! So much better than the one I have made every T Day for decades. I love brussels sprouts and that is a great, inventive way to cook them. Bookmarking this. I don't know how, Mary, but you ALWAYS have the BEST-sounding, easy recipes! I just LOVE them!! I was grocery shopping at 7:30 this morning to avoid the crowds. I bought some fresh Brussels sprouts for the first time ever and here you have a recipe for me. Yea. I've never met an eggplant I didn't like and this "bacon" recipe is something I've never seen. Last week I baked eggplant slices and ate eggplant sandwiches for three days. Very yummy. Bookmarked and saved in my recipe folder for sure. I love both eggplant and brussel sprouts! I found that chopped collards in an omelet with some cilantro...spices parmensan...yum. Awesome, have been loving all of your recipe ideas and can't wait to try the eggplant bacon! Seriously drooling at the moment! That crust looked as good as anything i've ever seen!